Twenty years ago, I stood nervously in front of a group of reporters. The bombing of a federal building in Oklahoma killed 168 people, including 19 children, shook the entire nation. Our local chapter of the National Association of the Advancement of Colored People (NAACP) took the lead in pushing back against the Islamophobia in media coverage and organized the press conference. The Council of American Islamic Relations (CAIR) had only been established a year before in Washington and their advocacy work had not reached our community in Northern California. In the decades that followed, CAIR has expanded across the country, as Muslim led initiatives have taken the reigns in combatting Islamophobia through political advocacy, interfaith outreach, and education. And during this time, it has become increasingly rare to see Black American Muslims, and even rarer to see Black American Muslim women, in media or in decision-making capacity in these national efforts. The erasure of Black American Muslims undermines efforts towards developing a unified front in the face of our greatest threat. Groups working in the field must take into account the ways in which their anti-islamophobia work alienates Black American Muslims. Scholars and experts on Islam in America have drawn upon the analytical framework of critical race theory to explore the "othering" and racialization of Muslims since 9/11. 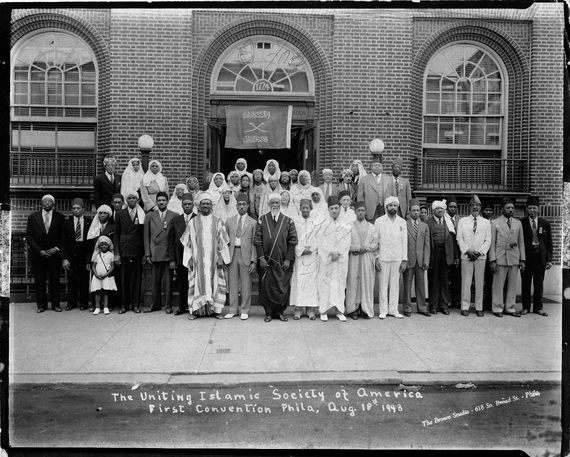 The "us versus them" binary that posits Muslims as the foreign "other" ignores the long history of Muslim in North America, which predates the Declaration of Independence. This binary erases Black American Muslims whose Muslim identity is homegrown, with few ties to trans-national ethnic networks. Black Muslims have critiqued National Muslim organizations that tend to privilege the immigrant and first and second generation American Muslim experiences, as well as trans-national issues. National organizations and leaders that rose to prominence post 9/11 shared the story of coming to the U.S. and becoming American while remaining loyal to cultural and religious identity, often distancing themselves from the narrative of Black American Muslim resistance against white supremacy. The assimilation narrative focused on highlighting how Muslim Americans were "just like" their white neighbors. Many Black Muslims have critiqued immigrants, second, and third generation American Muslims who see their sense of belonging as relative to their acceptance by white Americans, as opposed to connecting their struggle with other minorities. National Muslim organizations and advocacy groups largely led by South Asian and Arab Americans have made important gains and victories in the struggle for civil liberties and media representation, however many have left a wake of disgruntled Black American Muslims former employees, volunteers, and community members. Black American Muslims have not shied away from pointing out how anti-Islamophobia political advocacy, interfaith work, and media can be harmful to their communities. 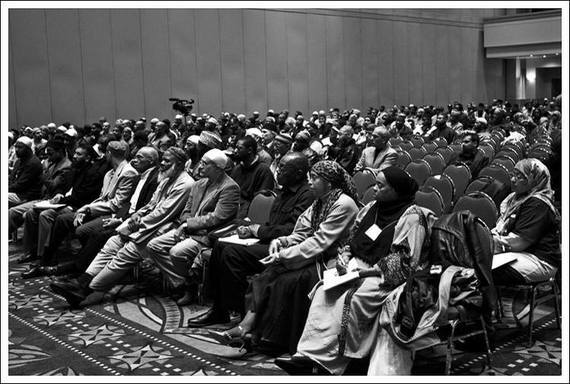 Black American Muslims have criticized Muslim political advocacy groups which focused solely on issues that relate to Muslims, while letting Black American Muslims fend for themselves on policies and laws that negatively affect them. Within interfaith work, suburban Muslim communities will often focus on Jewish and affluent White Christian denominations, while not building strong ties with working class Black and Latino congregations. Saadia Faruqi raises the question: Can Interfaith Work Lead to Racial Justice? While the absence of Black Muslim voices in political advocacy and interfaith organizing is notable, the most visible areas where Black American Muslims are missing is in media representation. Within both Muslim and mainstream media, Black Muslims still struggle to find themselves on equal footing with the non-Black counterparts. Outside of a few celebrity imams, African American Muslim leaders do not have the same popularity as South Asian, Arab, and White religious leaders. South Asian and Arab pundits often have tens of thousands of social media followers, access to media outlets, support from well funded institutions, and large media platforms. Some of these leaders and pundits highlight the immigrant narrative as the essential Muslim American story. A Google search of Muslim+American+ Dream returns over 5 million hits. These narratives highlight how America is a nation of immigrants, much to the pain of Native Americans whose land was stolen and to enslaved Africans who were forcibly migrated. One Southeast Asian imam made a point to say that the anti-Muslim hatred and violence is not the ideal of America that they immigrated to. Second and third generation American pundits, from suburban areas, make statements about how they are just like their non-Muslim neighbors. Others argue against Islamophobic rhetoric by showing how Muslim Americans contribute to society in fields such as medicine and science. These narratives often leave Black American Muslims feeling alienated. Gustavo Arellano welcomed Muslim Americans to the club of Public Enemy #1. When I read the article, it was clear that Gustavo was speaking to Muslims of immigrant origin, because Black American Muslims have always been under intense scrutiny by law enforcement and vilified in the media. Many Black American Muslims feel erased when they see these people, who have little interaction with Black American Muslim communities, universalize their experiences and speak for all American Muslims. The pinnacle of 'the shining city upon a hill' is firmly inhabited by Whiteness. The 'city shining upon a hill' was emptied of the natives by means of Genocide while down below in the valley, the plantation space, all the black, brown and yellow faces looking upward in the hope of being called uphill by the 'master' into the mountain top to experience proximity and to be touched by Whiteness, the 'human divine'. In essence, the successful immigration story is about assimilating into the city on the hill. In many ways, this is the aspirational whiteness. Few groups migrate to the United States with the hopes of aligning with oppressed communities, such as Native Americans, Latinos, and Black Americans. Aspirational whiteness is not always about hating oneself or culture, but about gaining access of white privilege. Individuals whose families have immigrated in the 20th century often hope to maintain their cultural identity to some extent. In order to maintain some cultural identity, while aspiring to that city on the hill, they must argue that they are a minority worthy of that position. The simple definition of model minority is an ethnic, racial or religious group whose members are perceived to achieve a higher degree of socioeconomic success than the population average. Muslims do this by showing their higher income, education, family stability, and low crime rates. This model minority myth is harmful because it is used to justify the mistreatment of Blacks, Latinos, and Native Americans.The model minority myth creates a type of Muslim exceptionalism. It plays out in subtle ways in the ways in which our community deals with where structural racism and Islamophobia intersect. Muslim exceptionalism leads us to not see the connections between other oppresses and marginalized communities. Muslim Americans can become passionate about one man's wrongful conviction, but they won't tackle the prison industrial complex, which has done the same to countless Black and Latino men. Muslim Americans can mobilize when one boy is arrested, but we won't look at the school to prison pipeline that locks up scores of Latino and Black boys. When we focus on Muslim exceptionalism and fail to see Islamophobia as an extension of structural racism, we miss important moments of connecting the Muslim community's struggles with other oppressed groups. We ignore the ways in which someone with intersecting identities, an African Muslim from an immigrant background may experience both Islamophobia and racism. Muslim exceptionalism leads us to think that the other minorities deserve their treatment because they do not come from good families, they are lazy, they are not ambitious, the are immoral. Muslim exceptionalism argues that Black and Latino communities deserve their conditions, but Muslims do not deserve to be mistreated. At its core is the Model Minority myth. The myth fosters internalized racism within certain Asian American communities against other communities of color. The model minority myth divides people of color and specifically serves as a tool of anti-black racism. The myth also serves to create "good" immigrants and "bad" immigrants. The model minority myth is used to deny racial justice. The model minority myth erases shared histories of oppression and of solidarity. Ultimately, the model minority myth allows for various groups to become a buffer in order to assist in the continual oppression and marginalization of Blacks, Latinos, Native Americans, and refugees. The tendency to adopt the model minority narrative leads to Muslim American groups distancing themselves from group that have been criminalized in the dominant narrative, unless we are deploying one famous ex-convict such as Malcolm X. Although African slaves were not able to maintain self producing Muslim communities their historical legacy is still strongly felt. Connecting to their cultural legacy, Black American Muslims laid down roots early in the 20th Century. However, we must also avoid the tendency to utilize Black Muslims like Malcolm X as historical footnotes. Non-Black Muslims who talk about building their legacy, while ignoring present day Black American Muslim voices, also contribute to continual erasures. Black Muslims are calling on their co-religionists to utilize their privileges in ways that demonstrate good allyship with Black American Muslims. Black American Muslims may not have capital, but we do have cultural currency and institutional knowledge. Further, Black American Muslims would like to be included in the decision making that non-Black Muslims take part in that deals with our collective future. South Asian and Arab led Muslim organizations should be more proactive in gaining perspectives of racial and numeric minorities in the Muslim community. Addressing these issues was one of the aims of campaigns such as #BeingBlackAndMuslim and #BlackInMSA. Many of us have tried to have private conversations and politely address the issue, only to be rebuffed and then marginalized for being trouble makers. The hashtags also serve as a pressure valve, releasing pent up anger and frustration so that important conversations can happen on the ground. People are discovering that they are not alone and that there are structural problems with the ways in which power flows in Muslim communities. People mean well in community building, and few people set out to exclude or discriminate. However, we all internalize dominant narratives and implicit bias, and quietly support policies, and practices which impact us all. We should take proactive and affirmative actions towards being inclusive and consider best practices to ensure inclusivity for our organizations, campaigns, and even our community life. We should remember that the narrative of a 19-year-old Black American Community College student can be just as compelling as a seasoned pundit. That encouragement I received reminded me that my voice as a Black American woman was important, and I spent the next two decades working to make a contribution to my community. When we raise multiple voices, we can ensure that our anti-Islamophobia activism works in a way that uplifts and liberates us all.